We just finished our first Hillsong Big Curriculum. I loved it. Like anything there were some things I’d like to see changed for next year overall I loved it. My story tellers and small group leaders alike loved it. Which brings me to the point of this post. Most of my small group leaders loved the cheat sheets for small groups that Hillsong provided. They loved them so much and seemed to help our small group leaders so I decided to make my own for our 252basics curriculum. You may ask why spend the time to make these? Great question. These cheat sheets do the following for our small group leaders. 1. Helps the small group leader stay focused – Know what they have covered and what they need to cover. 2. Helps the small group leader know the proper order of small group activities. Nothing more distracting than when your are trying to do prayer time and another group decides to do a game. 3. Helps the small group leader make eye contact and bring application to the kiddos. If the small group leader keeps looking at a full page copy of their lesson they construct a barrier to kids connecting. Connecting with their leader and with other kids. 4. Last and most important helps the small group leader focus on the kids and not on trying to remember what to say next. Bellow is a sample of the cheat sheet. If you would like a copy of the June cheat sheets or would like the Photoshop file to make your own please let me know and you want it and are a 252baics subscriber and I’ll send the files your way. What you doing to make 252baisics your own? Super idea Sam!! I just take the word doc. of the lessons and do some cutting each 252 lesson, there is alot for us. Helps with simplicity, however, this idea would definately help the sg leaders stay focused. This summer we are using the curriculum from Craig Jutila’s Empowering Kids called WHAT’S BUGGING YOU. The videos are excellent, I had to add to the small group stuff to just be more of what works for us. Should be fun though. Thanks for sharing your cheat sheet idea! Sam…we’ve been talking about doing this for a while now, and I want to give it a try over our summer months! I would love to get a copy of your June cheat sheets and the Photoshop file if you don’t mind sharing! We’re finishing up our 2nd year of 252Basics, and we love it! I think these will REALLY help our small group leaders! Right on thanks. We did what’s bugging you the kids really liked it. No problem I will send them on down. Hope they help. Our small group leaders love them. It’s perfect just enough to keep them on track with out being a distraction. Thanks for such a brilliant idea and by the way, in my previous ministry we used Empowering Kids so those that are wondering about it….It’s AWESOME and our kids absolutely loved it! It’s awesome that you’re sharing such a great concept. I appreciate your willingness to help others and not hold tightly to the things that you’ve put work into. Great Idea. The simplified cheat sheat will definately help keep the small group leaders focussed and on task. Thanks for sharing. 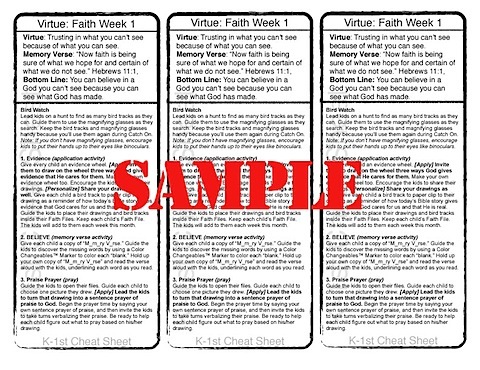 Glad to hear that the Hillsong Kids BIG cheat sheets were helpful for you and your team. It’s so much better for leaders to be leading their group without thumbing through pages of teaching!! Great idea! Could you send them my way? Would love to see how they work out for our small group leaders. have you thought about passing this idea along to rethink? I have mentioned it to them they seem open. I really helps alot at lest with our Small group leaders it does. Lovin’ the blog! I have used something like this (but not good looking) with our small group leaders so they don’t have to dig through the lesson. Your’s look great! Simple and easy to use! Guys thanks for all your encouragement. I hope you find it as useful as we have. Sam, what a great idea! Duh…why didn’t someone else think of this sooner. My SGL are constantly thumbing through pages of stuff when they forget what it was they wanted to say or do. I would be thrilled if you could share!! I would love to send you the link. Leave me your email address and I get on it. I tried the one you used to leave your comment and it didn’t work.